Look up at the sky? Is it a bird? It’s a plane? 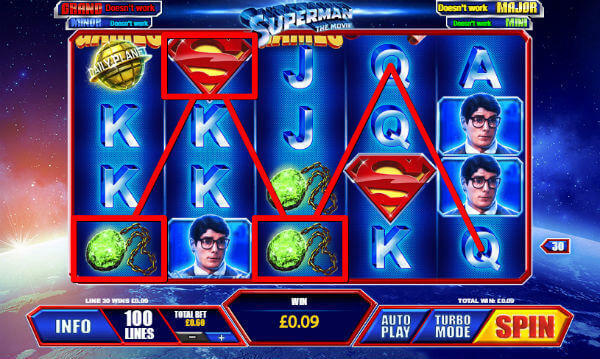 No, it’s a new Playtech slot featuring the one and only Superman! Or rather, three of them. Today, we will do a comparison of the three Playtech Superman slots (+ one by NextGen) to see how they match up. You will find quickly that even though it’s just one superhero, the slots have a lot of differences between them. The user interface across all three games remains more or less consistent, besides the NextGen one of course. Small changes are made here and there, but the colour palette and basic shapes remain the same, although the music and colours in Man of Steel have a different tone, reflecting the difference in the movies. 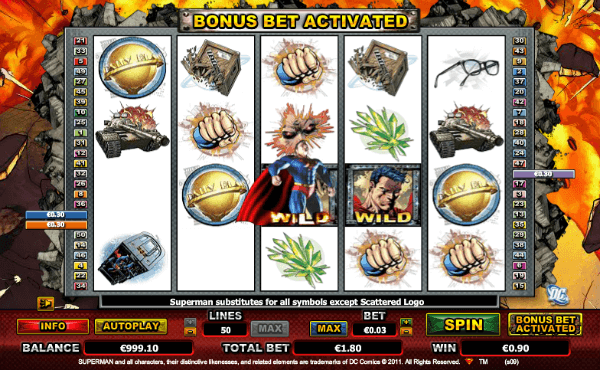 All three slots had special, unique artwork for them, but the first and second game also had gambling icons included – something the final title succeeded in avoiding. NextGen slot is a bit different and has a sense of street art or Japanese comics. Betting ranges, on the other hand, were quite varied from one slot to another. Superman: The Movie starts off with $0.60 up to $80, giving players a wide range to choose from. The sequel, Superman II, feels much more conservative in turn, allowing gamblers to play between $0.25 up to $25, a much smaller number. Man of Steel goes all out, allowing you to set a wager between $0.50 up to $2,500, deciding to go all out. Another thing all three games share are the four progressive jackpots. 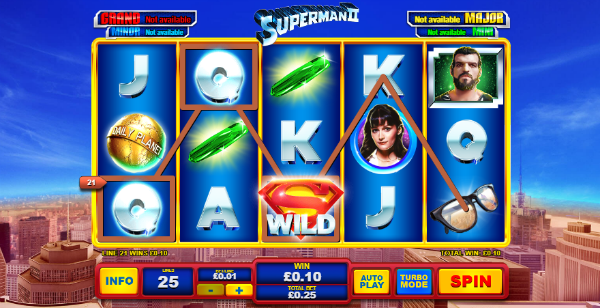 While most other things tend to become different from slot to slot, Superman has an identical mini-game associated with getting the progressive jackpot win, in which you pick random coins and collect the colour you need in order to win the jackpot you want. Playing these in a row, it often feels like Playtech had tried to outdo themselves with each consecutive release. The core of these bonuses comes from the somewhat unique mechanics they bring. Reels being locked, picking up specific symbols to end bonuses or transform them. While not unique to the series, they feel very influential to their identity. Superman The Movie feels very casual, a regular slot with the logo of the caped hero slapped on it for good measure. You have two rare, but quite valuable special features that can bring big wins, and which play with those relatively unique mechanics that follow throughout the three games. Then comes Superman II and decides that it is going to use the same mechanics to bring six different specials. You still pick shields, collect prizes and hope the wrong icon doesn’t pop up, but the same gameplay is now spread across different bonuses, and one of them literally has the same playing style as the progressive jackpot game mentioned above. It was honestly somewhat overwhelming to keep track of it all. Seeming to realize this, in Man of Steel, we see that the number was brought back to a more manageable three specials. You have one large bonus feature, and two smaller ones which feel like they belong in another slot rather than this particular trilogy. It does away with needless bonuses, attaching the recognizable mechanics to one, and the other two more or less amount to the same thing you would see in other games. Then in NextGen, you have the Bonus Bet feature which completely changes the reels. The feature itself is less volatile than the ones in Rainbow Riches and Monopoly Big Event, but still very fun. All three slots are unique in their own fashion. They all portray different movies, and you can see how Playtech has iterated throughout all of them as time went on. Despite having the same core theme – Superman – all three manage to stand on their own two legs, delivering a unique product. The first Superman game is great as an introduction. It has the recognizable theme music, it has a smaller number of special features, but it does a better job with them. It is also the first place where we see the progressive jackpot bonus game that will carry over across all three releases. It laid the groundwork for the second slot to slide in with ease. And so Superman II was more of the same. Playtech saw that people liked the original, and moved to make more of the same game. And while we liked it and the various special features it offered, it simply felt like too much was trying to be crammed into one slot. It had similar graphics, the same music was playing throughout the game. If you liked the first title and want more of it, this is the slot for you. Man of Steel is a more recent movie, and the game that accompanies it had some time to step back and see what had gone right and what did not in the sequel. We see this reflected in the massive amount of special features brought down to a more manageable level, replacing large but same bonus games with a varied, but smaller number of extras, and bringing back the larger betting ranges missing from the second slot. In general, if you are just starting out the trilogy, the third game feels the most polished – it had the most time to be refined, and the freedom it offers in betting range should attract both low and high rollers alike. The first slot is a great game as well, and you can clearly see the effort Playtech put into it. The second slot feels bogged down, and is essentially more of the first game. Give it a try, but we’d rate it last on this list in terms of enjoyability.